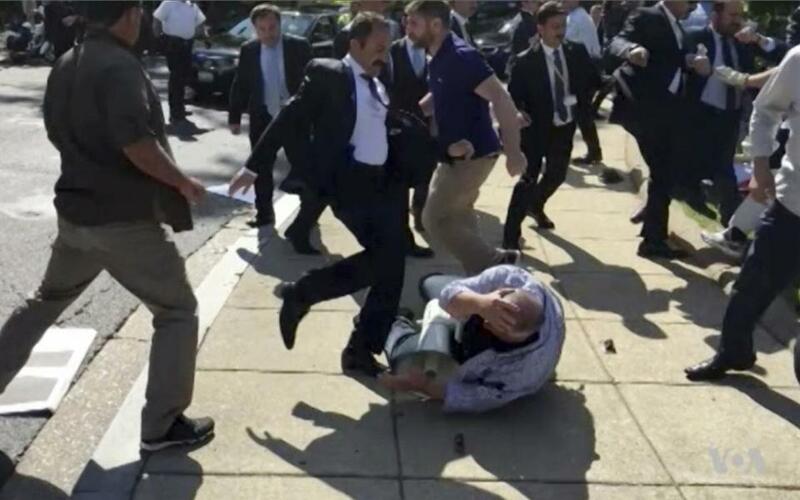 President Recep Tayyip Erdogan’s security personnel attack protesters in Washington in May. If you’re an American citizen, cancel plans for that vacation in Turkey. Don’t invite your Turkish friends to the United States, either. Recently Turkey and the United States stopped issuing visas to each other’s citizens. This is more than just another travel ban. It is a geopolitical spectacle unique in modern history: two allied countries blocking normal back-and-forth travel. An old relationship has gone deeply sour. It’s hard to imagine that Americans will be forbidden for years to visit Topkapi Palace, or that the Grand Canyon will remain off limits to Turks. Indeed, limited visa processing resumed Monday. But, even if the visa standoff is fully resolved the breach it symbolizes will not quickly heal. Turkey has been member of the North Atlantic Treaty Organization — making it a military ally of the United States — for 65 years. Officially it still is. The reality is different. Turkey has written itself out of the Western alliance. Rather than accept decisions made in Washington and at NATO headquarters in Brussels, it now behaves like a Middle Eastern country pursuing its own interests. Turkey has become the first NATO dropout. The causes of this crackup are a witch’s brew, with ingredients including Russian weaponry, Kurdish guerrilla fighters, a sanctions-busting gold dealer, two preachers, and a goon squad of presidential bodyguards. The brew is flavored by deep suspicions of the United States that permeate much of Turkish society. A recent survey found that just 13 percent of Turks admire American ideals, while 72 percent fear the effects of American power. This antipathy suggests that Westerners have long misjudged the Turks. After secularists led by Mustafa Kemal Ataturk seized power during the 1920s, they decreed that Turks must turn away from their Muslim and Middle Eastern heritage to become more European. Several generations were force-fed this creed. 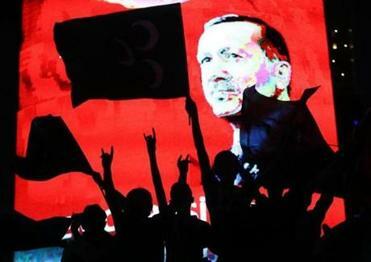 Then the Turkish political system opened up enough to allow the masses to express their true views. Many voters and political leaders turned out to be pious nationalists who do not want to live in an American-dominated world. This challenges two delusions about the Turks: first, that most of them are Westernized secularists at heart, and second, that as loyal “NATO allies,” they happily join Middle East wars and other made-in-Washington security projects. Turkey was progressive and free. Until it wasn’t. Will the US take heed? Roots of the current crisis in US-Turkey relations go back at least to 2003, when Turkey denied the US Army permission to cross Turkish soil on its way to invade Iraq. A few months later, American soldiers in northern Iraq arrested eleven Turkish security officers and, in images that are now seared into Turkey’s collective memory, hooded them while they were detained. Civil war in Syria has sharpened this strategic dissonance. The United States armed Kurdish factions that Turkey considers enemies. Turkey returned the favor by allowing Al Qaeda and other militant groups to ship weapons and fighters across Turkish territory into Syria. Anti-Turkish emotions in Washington flared in May, when an evidently amused President Recep Tayyip Erdogan was filmed watching his bodyguards pummel protesters outside the Turkish embassy. Erdogan is demanding that the US extradite a Turkish cleric who is living in Pennsylvania, and whom he blames for organizing a coup attempt last year. He has offered to free an imprisoned American preacher in exchange. Last month he raised the ante by arresting a Turkish employee of the US embassy. Erdogan is also worried about the looming trial in New York of a Turkish-Iranian gold dealer with whom he is said to have had corrupt dealings. He has also announced plans to buy a missile defense system from Russia — unthinkable for a NATO ally. He has even countenanced talk of pushing American planes out of the sprawling military base at Incirlik, near the Mediterranean, from which they carry out missions supporting wars throughout the region. Turkey’s defection is the latest and most vivid symptom of NATO’s failure to adapt to the 21st century. It was created to confront a single threat: the Soviet Union. That threat gave the alliance a clear mission, held its members together, and justified America’s dominant military role in Europe. After the Soviet Union collapsed, the United States could have declared victory, reduced its role in NATO, and turned European security over to Europeans. Instead it did the opposite. NATO remained an instrument of American power. It admitted a host of new members and is opening a sprawling new headquarters in Brussels. NATO, however, will never again be the powerful and united force it was during the Cold War. Turkey is splitting off because it now sees its own security goals as more important than those of the alliance. Other countries will make the same calculation. They will follow Turkey’s example: pretend to be NATO members while going their own way. Decay from within is not the only problem facing this calcified alliance. Worse is its lack of purpose. The American generals who run it must justify its existence by conceiving new missions. They have come up with two. Today NATO systematically confronts Russia with troop movements, arms buildups and maneuvers near Russian borders. At the same time, it supports American “out-of-area” wars in places like Iraq, Syria, and Afghanistan. Turkey has no interest in joining either of those projects. It feels no obligation to do so. That certifies its effective withdrawal from NATO. Prickly nationalism and an evolving sense of self-interest helped push Turkey to this point. So did America’s insistence on maintaining an old-style NATO after the Cold War ended. One other factor looms in the recent past. Turkey tried for years to enter the European Union. It was repeatedly rebuffed. With that historic choice, Europe slammed its door in Turkey’s face. Naturally the Turks began looking for friends and partners elsewhere. Even strategic alliances are not forever.